An In-Depth Look At The Director of The Sixth Sense, Unbreakable, Signs and The Village. Through revealing interviews with M. Night Shyamalan's childhood friends and neighbors, Academy Award-nominated filmmaker Nathaniel Kahn seeks to uncover the director's most intimate secrets and learn how they've been woven into the stories of his intensely powerful movies! And in addition to talks with cast and crew members, you'll witness insightful discussions with celebrities. As intriguing as Shyamalan's films themselves ... you don't want to miss this fascinating attempt to shed light on the unseen events and influences that have helped shape the spellbinding films of a masterful artist! However, don�t expect any insight into Shyamalan�s work from this program. Instead, Secret is nothing more than an insipid and pointless mockumentary. Originally aired on the Sci-Fi Channel to promote The Village, Secret focuses on the exploits of documentary director Nathaniel Kahn. It starts with an episode in which he finds he�s been mysteriously booted from his hotel room, and then the show jumps back four months to depict the creation of his documentary about Shyamalan. He receives promises of �unprecedented access� to the tight-lipped director but things don�t work out that way. Instead, Kahn gets limited contact with the cast and crew of The Village as he instead seems to stumble onto intriguing elements of Shyamalan�s past. When he scouts the director�s Philadelphia-area home, he finds teenage fans camped out in front. Kahn chats with them and uncovers eerie allegations. The rest of the film follows Kahn�s pursuit of the truth and the reality behind Shyamalan�s alleged fiction. When I finished watching Secret, I checked out other opinions out of curiosity. I was shocked to see that some people bought it as a real documentary and didn�t figure out the gag. Secret makes it abundantly clear from quite early that it�s not to be taken seriously. There are many hints due to the behavior of the participants and the various scenarios. One of the big clues comes from the treatment of Shyamalan himself as such a revered figure. I mean c�mon - do we really think 14-year-olds hang out at his gate like cult members? We�ve seen Shyamalan built up as the next Hitchcock for a while, so sometimes it�s tough to know how seriously he takes himself. Secret establishes the answer as �not very� since it toys with the notion of the director as a mysterious and important figure. In an odd way, the flick does a lot to deflate Shyamalan�s ego. On paper, this probably sounds good, but in reality, it�s tiresome and tedious. A lot of the problem stems from the film�s length. Something like this might have worked fine as a 25-minute TV special, but Secret runs past two hours. The thin concept wears out quickly, and the pacing seems atrocious. Secret toddles and meanders its way as it explores� well, not much of anything. We get the occasional �revelation� but mostly it�s heavy on atmosphere and light on content. My overriding memory is of endless shots of Kahn as he wanders about outdoors and looks frustrated. That doesn�t exactly make for scintillating viewing. Essentially, Kahn creates a two-hour wankfest in which he congratulates himself on his cleverness. Unfortunately, there�s nothing very clever on display. The premise is slight and the information found along the way offers little of interest. Not only that, but it takes forever to tell us very little. Occasionally we find some actual notes about Shyamalan, his past and his films, but there�s nowhere near enough content of that sort to make Secret an interesting documentary. Instead, it lives and dies on its conspiracy premise, and that renders it a failure. Not broad enough to become a good spoof and not intriguing enough to become an interesting mystery, The Buried Secret of M. Night Shyamalan fails in almost all possible ways. For every semi-cool moment - like an appearance by Johnny Depp - it includes many dopey ones. It�s bad, self-indulgent filmmaking and not worth your time. 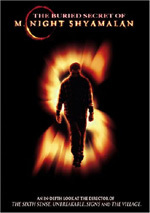 The Buried Secret of M. Night Shyamalan appears in an aspect ratio of approximately 1.78:1 on this single-sided, double-layered DVD; the image has been enhanced for 16X9 televisions. Secret maintained a generally decent picture despite a few problems. For the most part, sharpness was good. Some issues appeared due to the documentary style of the show, as focus occasionally struggled to find correct spots. A little softness not related to that issue also occurred, but usually the program stayed concise and distinctive. Minor examples of jagged edges and shimmering occurred, and some noticeable edge enhancement showed up throughout the show. The source material was generally clean despite a mildly to moderately grainy look at times. A speck or two popped up but no other defects interfered. Colors stayed on the muted side of natural. The tones usually looked acceptably accurate and distinctive but they never became terribly dynamic. I didn�t expect anything more than that, though, and found the tones to be perfectly fine. Blacks were also fairly deep and firm, while shadows were decent. Some low-light shots were a bit thick, but they stayed solid most of the time. There�s nothing exceptional about this image, but it was fine for this sort of material. Similar thoughts greeted the Dolby Digital 5.1 soundtrack of The Buried Secret of M. Night Shyamalan. As one might expect from a documentary, the soundfield stayed with a relatively restricted focus. Music demonstrated a good feeling of stereo presence and we got a nice sense of environment. The track stayed with general ambience and that was about it. The surrounds added little to the experience. An occasional isolated element popped up in the rear, such as when a helicopter flew across the back speakers. We also got some surround information at a nightclub and during a rainstorm. Otherwise, this piece stayed heavily focused on the forward channels. Audio quality was solid. Speech came across as natural and concise, with no issues connected to edginess or intelligibility. Effects seemed good given the source material. Usually documentaries lack much dimensionality, but this one�s elements seemed clear and accurate, though they didn�t tax the system. Music was warm and rich, with good breadth. The audio didn�t dazzle, but it fit the topic. No supplements appear on this DVD. That�s too bad, as something like a commentary would be nice. Slow-paced and without any form of tension or entertainment, The Buried Secret offers a combination of an elaborate hoax and a promotional piece. It does neither well, and it also fails to turn into an informative documentary. The DVD presents adequate picture and sound with no extras. And they�re charging 30 bucks for this thing? That�s insane. I wouldn�t recommend it at any price because the program is dull and pointless, but I can�t imagine how the studio can justify such a high price for a glorified supplement - and a bad one at that. Stay far away from this turkey.